Alopecia Areata which can cause a single small patch or several patches of varying size and occasionally these join together to cover an extensive area of the scalp. 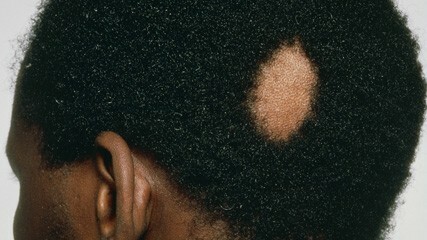 Alopecia Totalis which causes the whole scalp hair to fall. Oophiasic Alopecia Areata the prognosis of this condition is not good as rarely re grows, it can cause the whole hair line (front and back) to fall out. Alopecia Universalis this causes every single hair on the body to fall, often overnight. An example of this would be Duncan Goodhue who had a shock bereavement. This condition can be treated in the clinic and at home with the use of stimulants, ultraviolet light therapy (which causes an auto immune response and hairs grows as a reaction), and massage. In black hair Alopecia Areata, we are against the use of intralesional and topical steroids as any hair that regrows from these injections rarely remains. There are occasions where the use of hair pieces and wigs are advised for the short term- this often breaks the emotions connected to being an AA patient and the hair growth can resume. Specialist black hair piece and wig companies can be recommended via this clinic.